Someone please tell me what the HELL's wrong with all the people that run this country!!! If you don't share this with anyone....Who cares? Boeing buys land near its existing factory in South Carolina. They have executed to purchase more than l,000 acres next to their plant apparently planning its move of their other operations from high taxes and to a right to work environment. Wow, is Illinois and Chicago great or what? And he is going to 'fix' Washington politics for us??? I fear for the country. Note: Sent in to me by a reader without listing the origin or the writers name. Mayor O'Brien Fabricates His Intent. On NBC News this evening Mayor O’Brien blamed landlords for spreading what he called lies while attempting to explain his reasoning for hiring Global Strategy—a firm where Roy Occhiogrosso had been a partner before becoming Governor Malloy's advisor. Now Mayor O'Brien is apparently taking his advice from Roy & Phil by attacking the landlords with accusations that they are telling their tenants not to call 911 for emergency calls. Such claims are far from the truth when the property owners are in court fighting two ridiculous ordinances—only one being the " Hotspot" ordinance that places blame and fines against the landlords for the calls made by his tenants—calls the landlord has no control over. The mayor somehow feels that the landlord is to blame and deserving of a stiff fine if a man comes home drunk and beats his wife every night forcing her to call police to protect her from her husband. In the apparently radical extremist mind of our mayor, that evil rich landlord is to blame for everything that ails you including spousal abuse, burglars, car thieves and anyone else who may victimize you. Perhaps your landlord should be fined if your employer fires you from your job—after all—there is just as much causal connection to your landlord for you being fired as there is to you being beaten or abused by your spouse. Since this ordinance escapes any rational logic, could the true reasoning behind hiring this firm (which has a public record of representing Democrats in their election campaigns) simply be to use public money to shore up a mayor’s reelection campaign at taxpayer expense and not the reasons claimed on NBC news tonight? Unelected mayor of this city Is at it again. A city contact has divulged that the mayor's office has hired a communications firm for $100,000 to fight what he insists are false claims regarding the 911 calls as they relate to his infamous hotspot ordinance where the landlord can get an enormous charge for what he determines are excessive calls to 911 from his tenants. The landlords object to this form of taxation disguised as a fee for calls generated by tenants who may hate the propagator of the building. In another false claim to the public, the O'Brien Administration first started off by announcing a freeze on hiring, but turned around and hired a chief of Staff and an assistant chief of staff--Phil Sherwood. Let us also not forget the hiring of Mrs. Brown with what was falsely claimed to be HUD funds that never existed. Many of the Aldermen were even misled to understand it was HUD funds paying for her salary of $47,000 annually when they were told about the position. Now we supposedly need a consultant firm for an expenditure of $100,000 to correct the misinformation the administration accuses the landlords of spreading to their tenants to not make calls to 911. The ordinance is wrong in its conception since it tags the landlord for the call made by his tenants from his building however the landlords are merely asking their tenants to use the 826-3000 to make their calls to the city that are not emergency calls. Wouldn’t it be better for the city if the mayor would simply accept that his “hot spot” ordinance is just another in a long list of complete and total failures for his failed administration? Especially since repealing it would save the taxpayers the $100,000 they are now going to be forced to pay to a public relations firm in order to offer catchy slogans or jingles aimed at selling it to them. In addition to the $100,000 being blown by this administration, I noted that Mr. Sherwood in today's New Britain Herald has a new title ---Chief of Staff:::: Does this mean yet another huge raise from the frozen funds of the new administration? If the muzzling of city hall employees to not talk to certain members of the press, the misinformation of the Brown hiring, calling meetings without allowing the full public participation, and rewriting proposed apartment fees with agreement of only two landlords is not enough to make your blood boil, consider this: there is a rumor circulating that a possible reason for the hiring of this communications firm is that it allegedly somehow involves none other than Mr. Roy Occhiogrosso who will be the Governor's former aid one week from today. Could this be the position Mr. Occhiogrosso was alluding to when he suggested to the press that although he was leaving, he would soon be back in an undisclosed capacity? It is difficult to confirm how the public’s money is being spent when a mayor who promised open government operates his city hall in total secrecy while hiding behind a gag order on city employees. It is this “cloak and dagger” society operating out of the mayor’s office that creates an atmosphere for anyone in or around city hall to feel a need to anonymously release rumors in order to protect themselves from the perceived threat of retaliation by a person who is generally accepted to be the unelected mayor of this city. The UAW union has lost its battle with the state of Michigan. Many other states are attempting pass the necessary legislation in becoming a right to work state in order to attract new businesses for their state. The Unions have served their membership great representation in wining proper wages in the past however, the union’s heyday as become history and no longer needed because businesses have become irritated by the union’s bullying tactics. Therefore, these businesses are seeking to move their operations to a right-to-work States in order to stay in business. Don ' t just skim over this, it ' s not very long, read it slowly and let it sink in. If in doubt, check it out!!! So when someone tries to blame Bush. The Democratic Alderman after Hearing from their party chairman supporting the revised Landlord fees with many landlord speakers pleading to table this issue for after the holidays. Many that spoke indicated that this action will drive investors out of the city in fact one investor stated he owns multiple three family units that he purchase and brought them up to code has stopped looking for more properties in town but going to nearby Plainville for his new investments. I think Mr. Steve Amato, A local Store Owner, summed it up best with his stating " he has no stake in the issue calling it underhanded to have a meeting before Christmas with the problem being money and we are calling it fees instead of taxes." Alderman Giantonio attempted to have the issue tabled but the despot Democratic members voted his motion down. In Short this new plan that was agreed with only two landlords winds up charging the large owners less in fees that and owner that owns three families. The Mayor claimed that we have listen to hundreds of landlords--- being only two as a matter of public record made by the speakers at last night's fiasco. Baracka Clause is Coming To Town! New Britain city government is a mess. How so? O’Brien and Sherwood have destroyed the department structure of the City so that now, we have no permanent management system in our government. Without meaning to disparage any individual, we have now only four major departments with permanent, duly qualified directors, Parks and Recreation, Public Works, Personnel and Water. Even these departments have had changes thrown at them. Diplomatic Illness and Travelgate are Hillary's Reasons to not Testify. Former U. N. Ambassador, John Bolton, alleges she concocted the illness in order to not testify before Congress on the Benghazi attack and doesn't want to explain the reasons why the necessary protections were not to afforded to Ambassador Stevens and his entourage when they were under attack. Remember when the Clinton administration dodged perjury indictments on perjury charges? We can all remember the former President's famous statement "It all depends on what the word is is." Here we go again with the Clintons at it again. Well Hillary is no different. She is placing the blame onto everyone but herself according the ARB report on the Benghazi incident. It is straight out of the Clinton's cover up book. The report goes on how Ambassador kept on requesting added security but instead Clinton's minions a portion of the existing security forces out but who is the blame for this? Wasn't Mrs. Clinton who stated recently that she is responsible for everything that happens in her department. The Clinton cover ups continue on in history. Now Congress has been alerted that she will testify next month. Two Alderman Opposing Call for Friday's Council Meeting. On the Day of Mourning Declared By the Governor Mayor O'Brien announces to hold a meeting calling for the council to vote for his recent new rental fees that were established with the owner of the Pebble Brook Apartments. Alderman Jamie Giatonio and Alderman Carlo Carlozzi deserves recognition for opposing this move by the mayor even though Trueworhty claims that they must meet to approve the Covanta contract by Friday. The Question really is why was wasn't this meeting called for yesterday and not on the day of "Mourning"? The second question regarding the rental fees why the urgency? Why not wait for the Court to resolve this matter on March 3,2013.? New Britain Residents --Today we are asking for your help. Mayor O'Brien, in a move that has infuriated many members of the New Britain Common Council, has decided to schedule a public hearing for his controversial landlord licensing ordinance this Friday at 7PM, the same day Governor Malloy has called for a "Day of Mourning in Connecticut". We feel a public hearing is highly inappropriate when many of us are conflicted over the joy of the holiday and the sorrow of Connecticut's worst tragedy. There is plenty of time to discuss this ordinance as the implementation date is April of 2013. Now is truly a time to be with our families and loved ones. We ask you call Mayor O'Brien at 860-826-3303 and Council President Michael Trueworthy at 860-827-8816 and request they cancel Friday's meeting to show respect for the victims and their families of the Newtown tragedy and honor Governor Malloy's Connecticut's Day of Mourning. Pres. CT Property Owners Alliance Inc.
America is turning into a third world. The Obama administration has been advised by Harry Belafonte to imprison those who oppose his agenda. As each day passes we begin as Americans to realize that we are becoming a totalitarian fascist in turning America into a gulag. Sadly, America is losing its battle to retaining the freedom our constitution entitles’ us all as Americans. Mayor’s office announces compromise reached with Landlords. Nothing is further from the truth when in reality this alleged agreement was reached only with a few landlords and not with the major rental property owners in our city. The Superior Court case is still going ahead to determine the constitutionality of the mayor’s proposal this coming March. Ordinance Revised, Still Terrible » Citizen's Property Owners Association Inc.
New Britain's Fair Rent Commission? A New Fair Rent Commission has been formed by the common council for the City New Britain. Many of the media announcements, alluding to rental raises by the landlords, has allowed the O’Brien administration to advised the tenants to complain to the Fair Rent Commission if your landlord has raise your rent because of the proposed $150 per apartment fees. Amazingly, the media allowed the administration to make their comments to the tenants without listing the names of the new commissioners and where they can be reached. As of today the city's website does not list a Fair rent commission as one of its commissions. Sherwood should follow Occhiogrosso's lead » Citizen's Property Owners Association Inc.
Due to the ultra liberal socialist and their give away programs, many are moving out of Ct., not just to find work but get away from the extremely high taxes. Some are going to Florida while others are going to states that have low taxes and employment opportunities. Some in New Britain are also planning to leave Ct. in order to get away from the O'Brien & and the Malloy Administrations. Shrinking Fees » Citizen's Property Owners Association Inc. Contrary to what is being erroneously reported this morning by some media outlets, the CT Property Owners Alliance has not compromised with Mayor O'Brien on his landlord licensing ordinance in New Britain. We filed a lawsuit on November 13th to protect New Britain's landlords, both big and small and all of that city's good tenants. Nothing has changed, we are continuing forward with our lawsuit because Mayor O'Brien has created a self-inflicted budget problem and we will not let him punish both tenants and landlords because of his poor fiscal planning. CTPOA will continue fighting for the citizens of New Britain. We will not "Sell out" like Mayor O'Brien just did to one of his wealthiest political friends. There is no deal to report and we will be in Court again on March 6th. When the truth to whom O'Brien made this agreement with is discovered, it will show how desperate this administration has become. We are in this for the long haul and will continue to provide a voice for both small and big property owners and their good tenants. ITS OFFICIAL:EFFECTIVE DECEMBER 13TH.THE NEW POLICE STATION IS NOW OPEN FOR BUSINESS AT ITS NEW LOCATION! If you need to transact business with the New Britain Police Department its new address is located at 10 Chestnut Street which is at the Corner of Main & Chestnut Streets as of Thursday December 13,2012. Trusting that the men and women officers will able to do our citizens a better job in protecting the general public with all the sufficient equipment they now have to do their work with. The Connecticut Property Owners Alliance Meeting Rally held at the Falcon's Nest. Former Mayor Tim Stewart advised the conclave to watch savenewnewbritain.com on line and also indicated that he his writing another article for Robin's paper. Bob DeCosmo, of the property owners alliance, spent a considerable amount of time explaining that the landlords are facing next year's legislative proposals that are designed to "put landlords out of business." "Many of these proposals are making much harder for the landlords to evict tenants with the state providing funding for the legal Aid Attorneys to be able represent the evictees." "The State's CHRO after a particular case was found to be correct, this department decided to throw out the three positive court findings for this landlord, and brought him to enduring heavy additional legal cost in order to defend himself." As for the Hot Spot Fees DeCosmo declared that we cannot control our tenant's behavior as landlords and is a gimmick to raise revenues for the city. Mr. Eric Polinsky of the Carabetta Management Co. cited "that we have become more active in fighting the landlord fees because of the deception created by the city hall administration, while referring to Sherwood as being the Mayor's nephew, bringing laughter from the two hundred or so landlords in attendance, he said this is not a landlord issue but this is a citizen and government issue. He added that everyone is watching New Britain." Before the end of this meeting former mayor Stewart indicated that after the administration raided the water bureau funds it is rumored that they are planning sell this great city asset. "When you hear it from more the ten sources it becomes fact he added." The Court Injections is expected to proceed in court in March of 2013. Landlords and the CTPOA will meet at The Falcons Nest. This meeting is scheduled for 6 PM Tuesday, at 201 Washington Street in the second floor. Mr. DeCosmo will be updating its membership and citizens of the current status with the Court Injunctions against the City's ordinances. The Anti-Blight, Fair Rent Commission, and the Rental Property Business License should be included during the discussions with the owners. News sources have revealed that everyone needs to ponder how Susan Rice got so rich. She owns an estimated $600,000 of stocks in more than a dozen Canadian oil companies and should make you wonder why she wants to be the USA'S Secretary of State. She then would be able to push for the Keystone Pipe Line in order to turn her investments into massive profits. We can all recall Ms. Pelosi stating that we do not have time to read the documents but let’s pass this this and read it later. The liberals did this with their assumption with the passage of time this new law would grow in popularity and repeal would be a no-go. With 26 states wanting to secede from the union because of Obamacare may the repeat of the civil war that occurred many years ago. "What else Did Mayor O'Brien Lie to us about?" I'm going to bite the bullet, too!!!! President Obama ordered the cabinet to cut $100,000,000.00 ($100 million) from the $3,500,000,000,000.00 ($3.5 trillion) yearly federal budget. I'm so impressed by this sacrifice that I have decided to do the same thing with my personal budget. I spend about $2,000 a month on groceries, household expenses, medicine, utilities, etc., but it's time to get out the budget cutting axe, go through my expenses, and cut back. I'm going to cut my spending at exactly the same ratio (1/35,000) of my total budget. After doing the math, it looks like instead of spending $2,000 a month, I'm going to have to cut that number by six cents. Yes, I'm going to have to get by with $1999.94, but that's what sacrifice is all about. I'll just have to do without some things, that are, frankly, luxuries – six cents worth. "There are two ways to conquer and enslave a nation...One is by sword...The other is by debt." Ronald Reagan while a movie actor, delivered one of his best speeches during his career, which he gave at the Orange County Press Club on July 28, 1961. Reagan predicted that the Americans were slowly surrendering to socialism as the socialist predicted they would. He continued by stating that the socialist ultimate tool is the progressive tax adding, none to these extensions of socialism can be effective without money. The ordinance proposed by Alderman Larry Hermanowski requiring video cameras, metal detectors and guards in all night clubs would apply all establishments that hold café' permits that serve alcohol. In addition night clubs would also be required to expose all partners within the organization with a "fee" of $1500.00 for a license and application to the city. A club also is required to hire guards, one for every 50 guests, and to post at least two more guards in the parking lots. The owners will also be required to hire as many off duty police officers that the police administration requires. Even more disturbing is the fact that the Hermanowski requires that the private guards will required to use hand wand metal detectors on all the patrons. Hermanowski also wants to require working cameras at all entrances and exits and to include more cameras in the parking lots. He also wants to impose the checking of all patrons for the legal age (something already required by the state Liquor Control Act) and a $250 fine per day penalty for each violation will be assessed against the owners. This is a $250 fine assessed by the city and is above and beyond the fines already assessed by the state Department of Consumer Protection for these same violations. This in essence will force the existing establishments to leave the city which will soon become a ghost city with all the adverse proposals being introduced by this administration such as the infamous $l50 fee per apartment against the landlords together with the adverse hotspot regulation. Someone must tell Alderman Hermanowski that these establishments pay the state of Conn. a $5,000 fee for their license application. Wednesday night The common council's sub-committee on Finance and law approved in sending the proposed ordinance to the council but added a requirement of a $20,000 surety bond by promoters. Are the Aldermen looking for all the liquor license restaurants to leave town because of all the added fees they are imposing on them similar to rental and hotspot licensing fees the Landlords being subjected to? New Britain will soon become a Ghost Town If the administration gets its way. It makes you wonder what anti-business ordinance the council will dream of next. The New Britain Republican Town Committee is seeking candidates to run for elected offices in the upcoming 2013 Municipal Elections. Offices include; Mayor, Tax Collector, City Treasurer, Alderman, Board of Education, Board of Assessment Appeals, and Constable. Interested parties can attend the monthly NB RTC meetings scheduled for 7 p.m. on first Tuesday of every month in New Britain City Hall Rm 504; or contact NB RTC Vice Chairman Erin Stewart at stewart.erin@yahoo.comto express interest in becoming a candidate. All candidates will be required to visit our website and complete our candidate questionnaire. Interviews with our candidate selection committee will be scheduled for March. While the NBRTC is primarily seeking Republican candidates, we will also endorse Democrats and Unaffiliated/Independents who support efforts to lower taxes, limit government spending and create private sector jobs. The NB RTC has endorsed a fusion slate of candidates from all parties for the past three municipal cycles. The New Britain Republican Town Committee is also encouraging those interesting in continuing to move New Britain in the right direction by getting involved in local government, to attend one of our upcoming meetings. Mayor O’Brien is looking for ways to handle absentee landlord’s behavior. After mass demonstration that occurred at city hall with a crowd of an estimated 550 demonstrators against imposing the hot spot and licensing fees to be paid by the out of town landlords. These fees also apply to resident landlords who live in the city but not in his rental properties. The real question what will Mayor O’Brien and his council do when the court agrees with the landlord’s suit that the fees are arbitrarily selective and illegal? Raise taxes in order to make up for the short fall? Will the outspoken landlord, Sam Zherka, be forced to take up residence in the city so as to be able to direct his fight against the infamous eleven Aldermen re-elections who voted for these adverse ordinances. The Waterbury based Ct. Property Owner’s Alliance refers to the council’s acts as an selective money grab on the backs of landlords. That is why the real estate professionals recently announced that they are not recommending New Britain properties to interested buyers. But Sherwood calls this action is against “slumlords” but many of the out of town owners are responsible caretakers of their properties. Dwight Blint, on the other hand, calls it a discriminatory tax and not a fee which in turns hurts good landlords more than the bad ones.
" It would be interesting to know how the property taxes on the Cancer Center on the NB/Plainville line and the municipal services provided by NB and Plainville will be divided. Will they be equally shared or will New Britain end up getting the smaller piece of the property tax pie and more responsibilities to provide services? Citizen taxpayers should keep a very close eye on this venture. taxes for the multi-family property owners. This comes in the wake of two court filings requesting injunctions to reject two recent ordinances passed by the common council the infamous Hotspot, and the $l50 per apartment fees. The Mayor also ignores factual appraisals of our local property values plummeting by 30%. Mr. Mayor; you should be ready to raise taxes, after the court rules in favor of the landlord’s injunctions, in order for you and the common council to make up the anticipated income these bad ordinances would have realized. City of New Britain's "Gag Order" Against The New Britain City Journal! 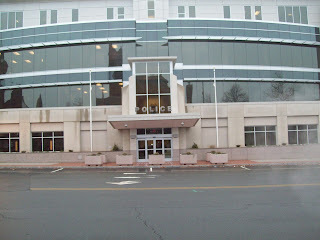 Denying the ability to make any comments by all city employees to the New Britain City Journal as ordered by the Mayor's office and Phil Sherwood may leave the city exposed to a federal violation of selection of one paper and not all papers by denying access for information distribution to one of the city's media. Spokesman Sherwood allegedly admitted he would even be limiting his contributions, to the journal, from the mayor's office and would have to see day by day if he deemed the paper worthy of comment. Does Sherwood really think he is New Britain's Messiah?? Not to mention the possible Law suit exposure, in addition to the Feds, that may ensue if the New Britain City Journal decides to sue for the vicious attack on its paper's selectively, credibility and discriminatory actions by the Mayor's office. With that many arrest involving some CCSU students. With 47 of the arrest being for underage possession of alcohol would certainly be a need for the elected top official of our city to address any and all press releases rather than his minion with his claiming it has been a long standing issue in the belvedere neighborhood being the reason for the controversial passage of the “ HotSpots” ordinance recently. Mr. Sherwood citing it is unfair for the taxpayers to be forced to subsidized nuisance complaints. Enough is enough; all the Sherwood comments should have been made by the elected official; the Mayor himself. The city’s electorate is entitled to hear directly from the Mayor. Isn’t the mayor wise enough to realize that all these Sherwood’s comments over the past year are only setting himself up to run for mayor during the next election cycle because the apathetic public believe he is the mayor from then many Sherwood quotes they read in the local papers . The Mysterious Rumors at City Hall Mounts UP. The cutting off of any communications with a local paper by the O’Brien/Sherwood administration has everyone talking. Many variations of explanations as to the real reasons the Mayor is upset with the New Britain City Journal but he is exposing himself and the city to a violation of the employee’s constitution rights-- “the right of free speech” denied to all city employees as reported in recently in the “CITY JOURNAL” and FSSNB. The Mayor’s/Sherwood’s worries are just beginning to surface and from my vantage point and they will not survive the onslaught. I have heard all the variations too numerous to mention but the most intriguing one is that Christmas will not be a good one for either of them. Perhaps, Mr. Sam Zherka, is just the man that can help the citizens of New Britain to fight city hall , by helping to rid the city of the 11 alderman who voted for the ill-conceived ordinances , and also for referring to him as a absentee slumlord.